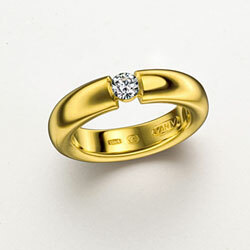 Astound her with this newly designed ravishing engagement ring. This 18k solid yellow gold diamond ring is sure to leave her speechless and will accompany your special moment to an unforgettable one. The 0.26 carat diamond is perfectly round cut, ensuring a brilliant and sparkling diamond of the highest quality.